Want to make real estate videos? Try Movavi Video Editor Business! Listings with video often get many more inquiries than with only still photos. To impress potential buyers, you need to create a video that shows your house, apartment, or office at its best. 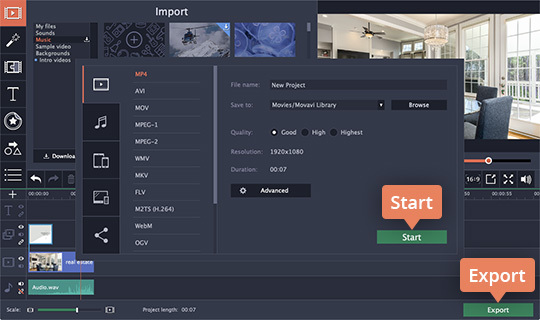 If you don’t have any experience in video making, but you still want to create a perfect real estate video, software by Movavi is just what you need. 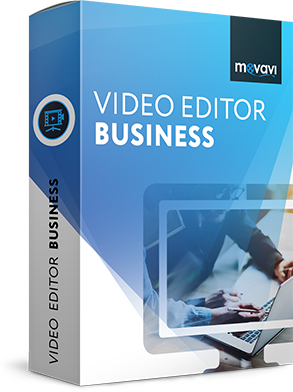 Movavi Video Editor Business has all the features and tools necessary for making a professional-looking video without the need for special skills. Read this article to learn how to make a real estate video quickly and easily. Make sure that all your rooms are clean, and all household items are well placed. Hide anything that might look unattractive on camera. Open the curtains to let more natural light in. Spruce up your interior with couch pillows, lamps, house plants, and other attractive small details. Shoot the best parts of your place. It might include a cozy corner, a spacious hall, a sunlit bedroom, a beautiful garden, or even a view from the window. Think what you would like the most if you were a potential buyer – that’s what you should show in your video. It is important to create a great experience for your potential buyers. When shooting a house for sale, try to create a feeling of walking through it, as if it were a real tour of the house. Add some soft background music to convey positive feelings to your viewers. Download the version of the software for your OS and run the installation file. Open the program after the installation is complete. Choose the New Project option in the start dialog. 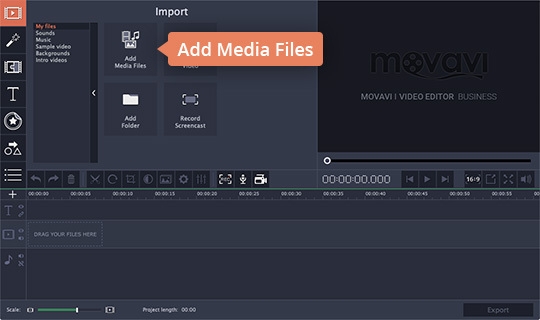 Click on the Add Media Files button and select the media files you want to use in your video project. Alternatively, you can drag the appropriate files from the source folder into the program window. 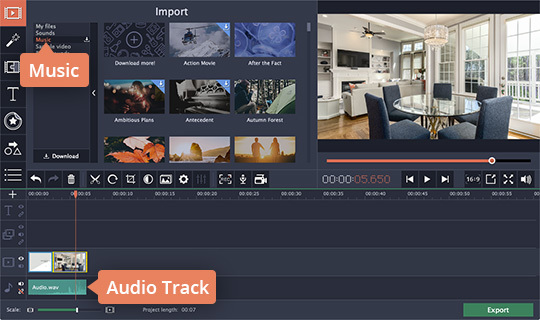 Now you can move the order of the clips on the timeline around, cut them up, and delete footage that doesn’t add to the finished product. To cut a clip, select it on the timeline and move the red marker to the point in the video where you want to make the cut. Click the scissors button labelled Split. Repeat these actions to make other cuts. To remove an unwanted piece of footage, select it on the timeline and hit the Delete key or click the trash can button. If you want your real estate video to look more professional, add an intro. To do this, go to the Import tab and click Intro videos. Choose the intro that best suits your project, drag it to the Video Track, and place it at the beginning of the video. To edit your selected intro, double-click it on the timeline, then double-click the title clip that appears on the Titles Track. In the preview window, you can change the text, the color, the animation speed, and the duration of the clip. Click Apply and return to save changes and go back to the main timeline. A good soundtrack will help you create the right mood and liven up your video. To add music, click Import > My files > Add Media Files and select the desired audio file, or simply drag and drop it onto the Audio Track. You can also use any tracks from the built-in music library: Import > Music. You will find Filters, Transitions, Titles, Callouts, Stickers, and other tools and features on the corresponding tabs on the left. Experiment with different elements to get the perfect result. 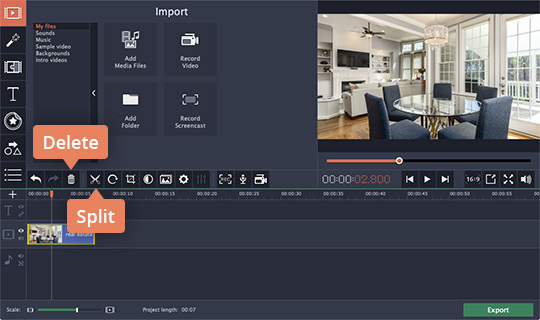 When everything is ready, click Export and select the desired output video format. You can also set a file name, the destination folder, and other export parameters. Click Start to save the file. Don’t be afraid to create your own real estate video, even if real estate videography and video marketing are completely new to you. 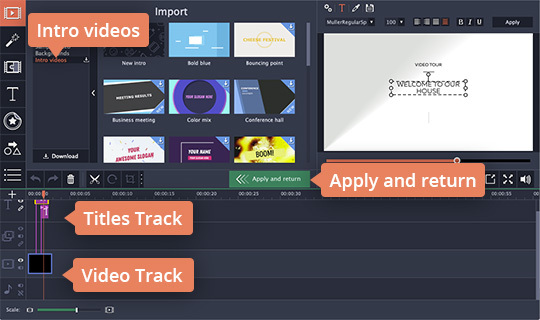 With Movavi Video Editor Business, the process of video editing is easy and fun!